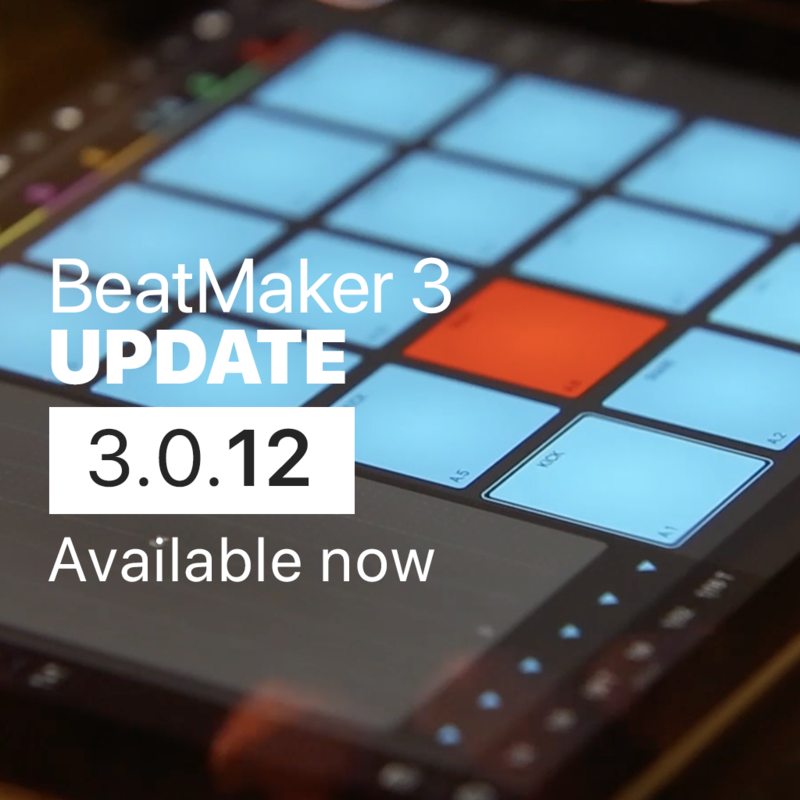 BeatMaker 3.0.12 is now live on the AppStore! - Adding On/Off Toggle for automation quantisation (better precision for recording parameter changes). 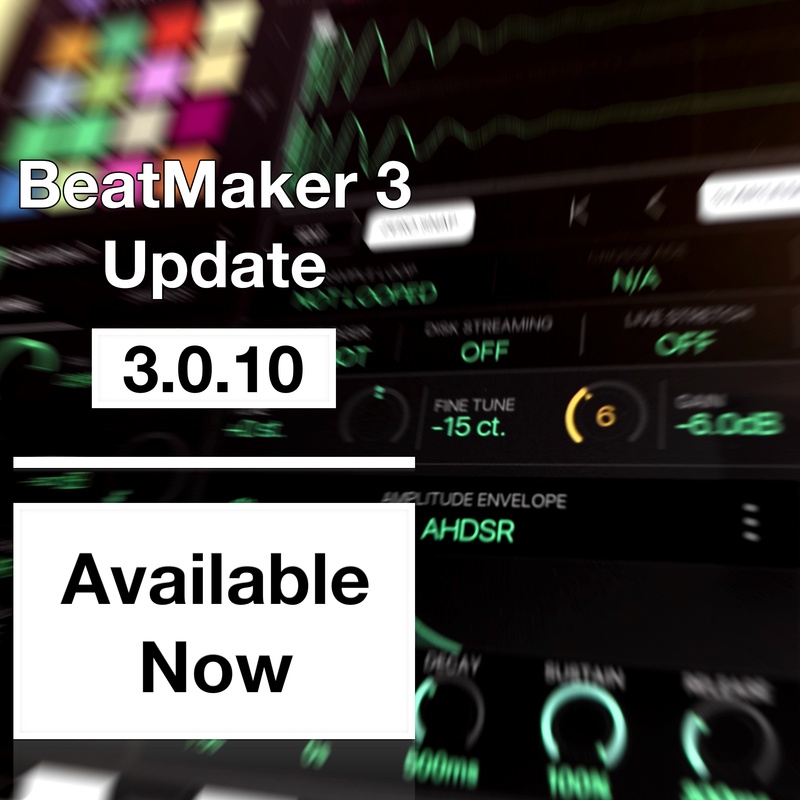 BeatMaker 3.0.10 is now live on the AppStore! The user's manual, in PDF format, has been updated as well. You will be prompted before BeatMaker 3 performs a library update / indexing. This will resolve the issue with slow app launch. You can always perform this action from the Settings screen within the app. Indexing of library files is now quicker and more robust. When indexing files and downloading packs from the sound-store, make sure the device doesn’t auto-locks. If the library database gets corrupted, BeatMaker 3 will warn you and offer to reset it. Added an option in the iOS Settings app, to reset the database file. This can solve issue with bogus libraries. Added a way to enable or disable the lookahead in the “Dynamics” effect, as well as setting the lookahead time for further tweaking. Parameters controlled by a macro will now act as macro knobs themselves, rather than displaying a panel to change/set the value. When displaying the FX panel back, restore the position where it was left on. Mixer levels can now be switched between traditional green/red levels and track colors. Simply press the “•••” button at the bottom right of the mixer. Added a RMS or Peak switch in the Mixer. Simply press the “•••” button to show the option panel. Added a channel strip size switch in the Mixer. Simply press the “•••” button to show the option panel. The 0dB graduation is now more prominent on mixer channel meters. Renamed quantization recording option to “Quantize Note On’s” and “Quantize Note Off’s” for clarity. Metronome options are now in a separate panel. To display it, long-press the metronome icon in the transport bar. Added metronome volume and tuning in the new metronome panel. Added “All Pass” filter type in SV Filter and 6-bands EQ effects. Added a toolbar to copy, paste, cut and clear pads when entering “SELECT” mode on the main Perform screen. When entering Pads “SELECT” mode, disable Repeat. Pressing the browser headers, and the plugins list headers will quickly jump back to the beginning of the list. Save and restore full-screen sample editor time reference. It is now possible to set any color on tracks, banks & pads with the RGB color selector in the track panel. It is now possible to set any color on macros with the RGB color picker in the macro setup panel. Keep the order in which parameters are connected to macros, in the macro setup panel. Audio tracks can now use any other tracks as their audio input (hardware outputs, auxes, other audio tracks). In the Sound Store, you can now see which pack you already own and if they are already installed. It is now possible to re-assign focus actions to another device. Display sample bit-depth and sample rate in the editors. Improved AUv3 & IAA MIDI events timing and sequencer position accuracy. In the Settings, it is now possible to set the iOS audio system in “high-quality mode” (aka “measurement”). This mode is intended for apps that need to minimize the amount of system-supplied signal processing to input and output signals. When double-tapping the sequencer stop button, don’t send note off’s messages on all 128 keys and all 16 channels. Zoom to maximum level when long-pressing sample editor [+] button. Slices can now be exported a separate samples. They will be saved in the main ‘Samples’ directory. Added an arm button to enable/disable track recording. Effect presets can now auto-create macros again. Bit-crusher max frequency limitation of 20kHz has been lifted. In the full-screen plugin view, properly show the AUv3 user interface again after displaying the “Add effect” panel. The “nuiFonts.db5” file, which was visible in browser Files mode, is now hidden. Fixed an issue with AUv3 MIDI plugins transport state (ie: Rozeta not playing the 1st downbeat). Fixed an issue where AUv3 would be notified about sequencer position changes in pre-roll / count-in. Fixed an issue with recorded quantized note off’s. Fixed an issue where the bank group was not properly restored on session load. Fixed a crash that would happen when double-tapping the track header in the Track Helper panel. Fixed an issue where user packs filtering would still show after library change. Fixed Saturator effect that would still apply output gain regardless of bypass status. Fixed an issue preventing some IAA plugins to appear in the list. Fixed an critical race condition between the audio engine and the UI that would crash the app when loading presets with lots of samples/layers (ie: BeatMaker Grand Piano). Fixed an issue where the audio track input label, in the mixer, would not properly update after reloading a session. Fixed the Slice Editor Snap L/R setting that was hidden in the “ENGINE” settings list. Fixed an issue on the song editor and sample editor where zoom would get stuck. Fixed an issue on the song editor where pinching would cut notes. Fixed track listing order in the Audio Export panel. Minor visual improvements around the app. Song position readout, in the transport bar, can be switched between BAR:BEATS, MM:SS.MS and SMPTE, simply by pressing it. Support of MIDI knob increment/decrement (“infinite” encoders), via MIDI RPN/NRPN. This also extend the range of MIDI CC’s to 32766. The transport bar record button will now be red when recording. Added an option, in the recording panel (press the ‘Q’ label on the transport bar), to disable minimal note length quantization. It is now possible to show/hide the left global navigation bar while displaying the AUv3 keyboard screen. This gives access to effects and macros from that view. It is now possible to tag packs & categories on a selection of files and directories, recursively from the Browser in files mode. Create a new bank, load an instrument or plugin, preferably in KEYS mode. Enter the new bank MIDI Setup panel by long-pressing the bank above the pads or by pressing “•••” on the right of the bank name on the left screen. Connect the MIDI input port to the virtual AUv3 MIDI device that BM3 has created for the app. Added a ruler button on the full-screen sample editor to switch the time reference of the bottom grid between seconds, samples and bars/beats. When using the “Add to existing layer” sample load method, get the currently selected layer rather than the last one. The layer can be selected from the editor screen > SAMPLES tab, just below the small pads selector. Added move left/right and zoom in/out tools on the mapping editor toolbar. The “Stereo to Mono” sample process tool now offers the possibility to use only the left or right channel. When selecting a sample from the mapping editor, highlight it as well in the “SAMPLES” listing. When drag’n’dropping a sample that is added to an existing layer, auto-select it in the “SAMPLES” listing. Added tooltip next to sample markers when moving them, that will follow the current ruler unit (seconds, beats and samples). Improvements on the “Zero Snap” tool: adapt scan size to the currently visible range and find the closest zero-cross against all channels. Sample editor zoom in/out is now behaving more naturally. Sample editor move < and > buttons will now behave more naturally. Double-tapping the sample editor “START/END” or “LOOP” button will focus and recenter. In the full-screen sample editor, added a marquee above sample & loop start/end markers to make it more obvious the area can be dragged. Zoom in/out and |<, <, >, >| functions are now consistent on all three modes: select, slice and normal. “Grid Snap” can now be used in Slices mode in the sample/slice editor. Long press on [-] and [+] on the sample editor will resp. fully zoom out or in. Added a setting for the transport stop behavior: it can either go back to the start of the track, or on the latest position (by pressing the bar / position in SONG mode). When drag’n’dropping a sample onto the mapping editor, follow the browser load method. Fixed a crash that would happen after loading an effect or modulator preset that has modulations or macro’s connected to it. Fixed an issue in the editor layers/samples list where selecting a sample in another layer would not properly show the “•••” button. Fixed a browser glitch where the pad loading toolbar would be displayed on top of the Dropbox toolbar. Fixed an issue where it was not possible to drag’n’drop a sample after C5 on the mapping editor. Fixed Modulation Delay effect that would still apply processing when depth was set to 0%. Fixed an issue where the IAA plugin selector list would still display “already loaded” after unloading the app. Fixed an issue where exporting sliced sample to Apple Loop will not preserve number of beats and tempo. Fixed an issue in the browser where sharing a file from a group would bogusly pick another file. Fixed an issue where the small sample editor would not refresh properly after loading a sample. Fixed an issue with creation of new sample editor file names that could affect note/octave numbering. Fixed an issue where some sample processing command wouldn’t do anything and would require moving markers beforehand. Multiple fixes and improvements on the Auto Pan effect: volume will remain constant when bypassing or activating the effect, and improved depth handling. Fixed a potential crash that could happen when dismissing a text entry. Fixed AUv3 client UI resize and refresh issues. Fixed the Auto-Scale feature that wouldn’t set the Fine Tune parameter properly. Fixed a crash that could happen when using samples with bogus sample start/end or loop start/end information. Fixed an issue with the validation of purchases on iOS 11.2. Fixed double tapping of a value in the parameter panel, that would reset it before showing the text input. Fixed an issue where the mixer would not show any level. Fixed an issue where audio recording wouldn’t start or record anything. Fixed a crash that would happen when exporting slices to a new bank. Fixed a browser issue (library and files mode) that would happen when dropping a file back onto the browser itself, creating an useless duplicate. Fixed an issue where the sample editor zoom level would reset after using bounds arrow |< and >|. Fixed a crash that would happen in the full-screen sample editor with no sample loaded. Fixed a crash that would happen when duplicating pads with AUv3 instruments loaded. Fixed a playback issue with samples with a 1 frame loop. Fixed jitter of waveform when zoomed in. Improved handling of iOS11+ gestures that could conflict with some UI elements (editor keys, sample editor, pattern editor key roll, etc.). It is now possible to create new audio & aux tracks directly from the Perform screen. Added a new MIDI routing option (in the MIDI Setup panel of banks), to set a Bank either in “Single Channel Mode” or “Multi Channel Mode”. In “Single Channel Mode”, the incoming MIDI note is used to route the message to the matching pad: for example, C3 (note 60) will trigger pad 60. In “Multi Channel Mode”, the incoming MIDI channel is used to route the message to the matching pad: for example, a message on MIDI channel 12 will trigger pad 12. The small pads on the editor will light up when receiving note events. Banks will be set to “Single Channel” mode by default, listening on Channel 1. This way, you only need to configure an input MIDI device for the bank. If you set the Bank in KEYS mode, you can quickly and easily play melodic instruments with minimal configuration. In the library browser, group sessions/banks/samples that have a similar names. This way, duplicates are grouped into one single entry, make listing easier to browse. These multiple entries can be “entered”, showing their exact location on the filesystem. Auto-close the Settings screen when switching between global screens. When loading new samples, it is now possible to add them to an existing layer. See the “Load Method’ option at the bottom of the browser toolbar. In Perform “MUTE” mode, muting pads will properly send “Note off” messages to the sampler or plugins. When loading an AUv3 or IAA plugin on an empty Bank, automatically enable KEYS mode. Double tapping the transport Stop button will also send “All Notes Off” and “Note off”s to AUv3 / IAA plugins. Improved grid contrast in pattern editor. Improved white keys lane contrast in pattern editor. “Note off” messages will pass through even when MIDI is muted, so no notes get stuck. The “MIDI Panic” button in the Settings/MIDI tab will also send “Note off”s to every keys on all 16 MIDI channels. When drag’n’dropping a sample, either from the sampler or from Files.app, make sure “Disk Streaming: is automatically turned on for large samples. Fixed an issue where plugins loaded on pad 17 to 128 would receive bogus MIDI data. Fixed an issue where drag'n’dropping a file from the browser and back onto it would corrupt the file. Fixed a bug where deleting a bank would render banks ordering and selection unreliable. Fixed an issue where “Open In…” samples from Audio Share would not import anything. Fixed a crash that would happen while dropping a pattern from the track helper onto the pattern editor. Fixed a crash that would happen when drag’n’dropping a MIDI file on the pattern editor. Fixed a bug where multiple negative length patterns would be created. Fixed a glitch that would be displayed when dropping a sample on an empty sequencer track. Fixed a bug that would happen while pinching over a pattern and pressing the resize tooltips simultaneously. Updated Dropbox SDK to 3.4.0. Support of iOS11 Files.app: you can drag’n’drop sessions, banks, samples and ZIP files directly into BeatMaker 3. BeatMaker 3 supports iOS11 Inter-device Audio and MIDI (iDAM). This lets you send audio and send/receive MIDI to/from your Mac computer, using a lightning cable. Support of BeatMaker 2 projects. Native iPad Pro 10.5” resolution on iOS11+ (1112x834). Improve the “Save Session” feature. It is now possible to save each bank separately as a copy, within the session folder. Added “Quick Save” for saving sessions rapidly. Dropbox file listing is now sorted alphabetically. After a successful audio export, offer to share the audio or zipped content (in case of multi-track export). It is now possible to tap the tempo from the focus action “Tempo”, when it is assigned to a key/note. Perform pad muting behavior is now available as an option. It is now possible to select between muting just the MIDI/events, or audio + MIDI. Mixer track muting behavior is now available as an option. It is now possible to select between muting just the audio, or audio + MIDI. Large texts will now auto-scroll. It is now possible to access the left global navigation bar from full screen keyboards, giving access to effects and macros panels. Double tapping a bank track header in the sequencer and track helper will automatically select the track and jump to the Perform screen. Double tapping an audio track, output track or FX track header in the sequencer and track helper will automatically select the track and jump to the Mixer screen. Added a “PLUGINS” tab in the browser for loading AUv3/IAAs/Audiobus plugins easily. Browser ‘Files’ mode will now auto-refresh directories when going back or saving a session, bank or sample. In the sampler / edit screen, added two handles around the preview keyboard at the bottom to scroll up and down. The editor sample preview button on the top toolbar will now play the currently displayed sample using layer settings. Added a “preview” button on the full-screen sample editor for previewing/auditioning selection without any layer/effects applied. It is now possible to edit the tempo value with the keyboard in the sample time-stretch panel. Added Pre/Post Fader Sends option in the Mixer: just select a track and toggle the option. Mute/Solo volume drop is now quicker. In the mixer, pad channel strips now show the pad number below the track name. Track SOLO will now override MUTE state. The MVerb “Pre-Delay” parameter is now displayed in milliseconds. New touch handling for Pattern editor. Long press in pad/piano roll and timeline will enable row/column selection. Long-pressing a scene cell will display a panel. This is useful to switch a pattern of a scene that is not playing. New Quantize panel with swing options in pattern editor. It is now possible to set the pattern duration in the pattern editor, using the zone at the top. It is now possible to jump in the song timeline while keeping quantization. Double-tapping on Bank selector buttons in the Perform screen will not auto-open the Browser anymore. This was problematic in MUTE and SOLO modes. When favoriting an item in the browser, the list won’t jump back to the top. When replacing a sample on a pad, keep MIDI input/output port & channel settings. Properly create pattern using original sample tempo and bar length when exporting slices to pads or layers. Do not list the “BeatMaker 3” virtual MIDI output port in the settings device list. Fixed multiple MIDI routing issues on banks when OMNI mode was OFF. Fixed sampling-rate mismatch with AUv3 instruments, which would cause them to be out-of tune and/or out-of-sync. Fixed fullscreen Step Modulator mode where transport controls wouldn’t react. Fixed a bug where some elements of the UI wouldn’t reflect the current bank color. Fixed an issue in pattern editing that would cause notes to be released. Fixed individual pads audio export and fixed pad number listing in the panel; additionally, filename format is cleaner too. Fixed an issue that would cause patterns to stop playing when editing notes. Fixed double-tap on tempo parameters (transport, sample editor) that would bogusly reset to 90. Fixed double-tap on big plugin icon in the Editor > PLUGIN tab, that would bogusly create multiple full-screen keyboard. Fixed library search result list that would not reset properly after selecting a pack, category or subcategory. Fixed an issue where the “Tempo” focus action, when assigned to a key, would use the velocity to set the tempo. Fixed a crash that would happen when loading a new bank with patterns on the pattern editor. Fixed a crash that would happen on audio tracks when setting start marker on top of end marker. Fixed a bug that would happen when loading bogus parameter values, leaving the audio engine muted forever. Fixed a crash that would happen while loading a bank. Fixed a critical memory leak. Updated Audiobus SDK to 3.0.2. Temporary focus in Pattern editor (long press without moving will zoom momentarily). Updated Ableton Link SDK to 2.1.1. Added keyboard icon in the global left navigation bar for quick access of the currently selected instrument from anywhere. Double keyboard mode is now available in the full-screen keyboard screen. It is now possible to adjust the master tuning of a session (Settings --> GENERAL). Max undo/redo history is now 64. Visual improvements on the sample editor markers, selection and tools. Visual improvements on the audio export panel. Improved the GENERAL settings, cleaner CPU/RAM meters and options. Preview volume setting now applies to the sample editor and audio recorder previews. Added copy & paste in pattern editor. Added two new slice snapping (left/right) tools in the full-screen sample editor. The default behavior can also be set in the settings screen. 6-band EQ graph now shows frequencies up to 20kHz. It is now possible to draw the note length by long-pressing a new note on the pattern editor. When a track is muted (or excluded from the solo group), no MIDI data will be sent on output. It is now possible to set the current chord/scale from the full-screen keyboard. It is now possible to set SCENE trigger quantize value In the perform screen in SCENE mode. Chords/Scales screens are now available along with the velocity, roll and wheels zone. Added “Fade In” parameter in sampler SLICE mode. Note that this is a shortcut to the amplitude envelope Attack parameter. Full-screen step modulator improvements: display the value tooltip and the small keyboard. Fixed multiple crashes that would occur while editing and managing samples and layers in the editor. Fixed various sample start/end and loop start/end related issues. Fixed reading of samples that have more than 2 channels. Fixed a visual glitch in the library browser category filters and results, that would bogusly get stuck, showing no items. Fixed a visual glitch in the audio export panel that would make it impossible to export multiple tracks in WAV format. Fixed an issue where loading a preset on an existing bank would change the current bank and bank group. Fixed an issue with the MIDI OMNI settings button. Fixed an issue where AIFF samples were not tagged properly. Fixed an issue with MIDI device listing in the settings screen. Fixed auto-scale crash on audio clips on the sequencer. Fixed trigger of audio pattern in SCENE mode. Fixed pads / solo bug where bank would stay in solo after disabling solo on last pad. Fixed file size labels for < 1kB files, which would bogusly display “0 byte”. Fixed a crash that could happen while displaying a delete modulator. Fixed support of Bluetooth speakers (through A2DP / iOS10+ only). Fixed effects preset listing glitch. Fixed an issue where the sample selection would not reset upon sample, pad, bank or session change. Fixed a crash that would happen while changing the default audio preview volume after creating a new session. Fixed peak meter highest value indicators that wouldn't decay down completely. Fixed an crash that could happen while loading a session from the welcome screen while an iOS pop-up appeared. Fixed missing elapsed time label on the audio recorder. Fixed an issue with layers folders in the editor SAMPLES tab. Added 16 bank groups, each bank group has 8 banks, giving a total of 128 banks. Added focus actions to jump to a specific bank group, and iterate to the previous or next bank group. Added a MIDI Panic! button in the MIDI tab in the Settings screen. Added the saturator effect to the main FX list. Added an option to save a bank preset either in the current directory or in the main/general ‘Bank Presets’ directory. Added a ‘Set value on all layers’ options in the parameter panel. This will set the current value on all layers, and also works for layer FX and modulators ‘siblings’. Added the ‘auto-scale’ feature back from BM2 in the sample duration panel. This lets you pitch a sample on a specific bar length. Added default layer gain in settings/general. Added browser preview volume in settings/general. Can now reset step modulator steps by double-tapping them. Added full-screen option for step-modulator. When double-tapping an hardware output track in the mixer, it will open the FX panel, like for AUX tracks. Added current status text when scanning files (database update or reset). Added error messages for network connection issues in the sound store. New hard-reset option for database in settings/general. Use with care. Fixed sample saving from audio tracks/clips. Properly update steps after loading a step modulator preset. Improved AUv3 instantiation and clearing. Fixed scrolling of history and error panels. Fixed AUv3 FX screen keyboard event routing. Fixed audio clip thumbnail after tempo changes and live stretch mode change. Fixed an issue with voice stealing/killing of audio clips. Fixed MIDI editor velocity values. Fixed synchronization issue in the Step Modulator. Fixed monophonic mode in the Step Modulator. Fixed an issue where bank solo state would not recover properly after loading a session. Fixed selection of samples after edition. Fixed an issue that could occur with streaming and live stretch while editing a sample. Fixed an issue with audio clip triggering. Fixed import of samples and bank presets with custom categories and subcategories. Fixed a race condition that could occur with multiple imports happening simultaneously. Added a "MIDI Setup" button when loading an IAA or Audiobus plugin, both on the PLUGIN tab and within the split keyboard screens. This makes setting MIDI output port & channel easier for apps that need proper configuration. Added an option in MIDI settings (Browser > Gear icon > MIDI tab), to toggle MIDI data forwarding to the selected pad, a.k.a. 'OMNI'. When turned off, MIDI routing will be performed regarding Bank / Pad MIDI input configuration. When turned ON, every MIDI messages will be forwarded to the currently selected pad. All this happens if the MIDI message wasn't assigned to a MIDI focus action. Focus actions learning can be cancelled by simply pressing the button again. Also, when switching tabs or hidden the view, learning will be silently stopped. Instantiation of AUv3 has been improved. Improved support of BM2 presets. Renamed "SVFilter 6" to "6-band EQ". The "Velocity" ON/OFF toggle on the keyboard screens will properly be restored. Improved USB/iTunes file import, the Documents directory will refresh automatically and ZIP files will be extracted and content imported. It's now possible to tag sessions, bank presets and samples in the browser 'Files' + EDIT mode. It’s now possible to add custom categories and sub-categories. Improved the "Restore Purchases" functionality. Improved Audiobus support (ports naming and icons). Improved sorting of samples in the 'SAMPLES' tab of the Editor screen. Case-insensitive sorting of IAA plugins. Double-tapping a pattern while in SELECT mode (SONG) will open the Pattern Editor. Disabled crossfading for sample using disk streaming. Properly update the extra frame needed for linear interpolation, in regard of current looping mode. Added a 'glow' animation to make it more obvious than an user action / MIDI message is required. Fixed an issue where the plugin selector would keep being re-created each time a pad was changing. This led to various crashes. Fixed "channel-less" MIDI messages that would cause subsequent MIDI data to be interpreted as SysEx, resulting in some unexpected behavior. Now, for example, the BeatStep Pro transport buttons work as expected. Fixed IAA instruments & effects timestamping. Now, most plugins should behave normally. Fixed internal MIDI port feedback loop, since two "BeatMaker 3" ports (input / output) were listed in the MIDI input / output ports list. Fixed an issue where AUv3 saved in a bank preset wouldn’t recover their state. Fixed a glitch in the Macro Screen that would make it impossible to switch between macro slots and display the X/Y zones. Fixed Sound Store result parsing leading to crashes. Fixed and improved MIDI import, it is also now possible to import MIDI in SCENE & PATTERN modes. Fixed a crash that could happen while disconnecting from Ableton Link. Fixed a crash that could happen while installing multiple sound-packs. Fixed a crash related to selection of current scene. Fixed an issue with some recorded patterns that would lead to a crash when exporting. Fixed UI rendering of stretched audio clips. Fixed default position of value editors with patterns. Fixed a crash that would happen when disabling the default Amplitude Envelope and setting the trigger type to 'HOLD'. - You will be prompted before BeatMaker 3 performs a library update / indexing. This will resolve the issue with slow app launch. You can always perform this action from the Settings screen within the app. - Indexing of library files is now quicker and more robust. - When indexing files and downloading packs from the sound-store, make sure the device doesn’t auto-locks. - If the library database gets corrupted, BeatMaker 3 will warn you and offer to reset it. - Added an option in the iOS Settings app, to reset the database file. This can solve issue with bogus libraries. - Added a way to enable or disable the lookahead in the “Dynamics” effect, as well as setting the lookahead time for further tweaking. BeatMaker 3 is constantly improving thanks to your feedback. https://intua.net/blog for more update info.